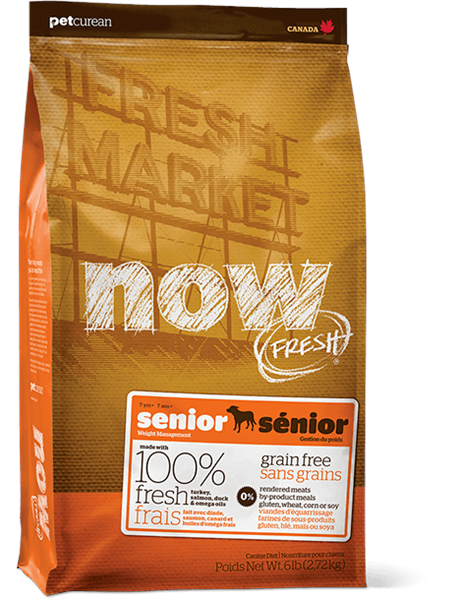 NOW FRESH™ Senior dog food recipe is made with 100% FRESH turkey, salmon, duck and 100% fresh Omega 3 & 6 oils from coconuts and canola. NOW FRESH™ also features zero grains, gluten, wheat, beef, corn or soy. Zero rendered meats, by-products or articial preservatives. 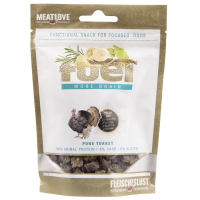 De-boned turkey, potato ¨our, apples, pea bre, peas, potatoes, tomato, alfalfa, canola oil (preserved with mixed tocopherols), natural ¨avour, salmon, de-boned duck, coconut oil (preserved with mixed tocopherols), whole dried egg, ¨axseed, carrots, pumpkin, sweet potatoes, squash, bananas, blueberries, cranberries, blackberries, pomegranate, papayas, lentils, broccoli, calcium carbonate, dicalcium phosphate, sodium chloride, potassium chloride, vitamins (vitamin E supplement, L-ascorbyl-2-polyphosphate (a source of vitamin C), niacin, inositol, vitamin A supplement, thiamine mononitrate, d-calcium pantothenate, pyridoxine hydrochloride, ribo¨avin, beta-carotene, vitamin D3 supplement, folic acid, biotin, vitamin B12 supplement), minerals (zinc proteinate, ferrous sulphate, zinc oxide, iron proteinate, copper sulphate, copper proteinate, manganese proteinate, manganous oxide, calcium iodate, selenium yeast), taurine, DL-methionine, L-lysine, glucosamine hydrochloride, dried chicory root, dried Lactobacillus acidophilus fermentation product, dried Enterococcus faecium fermentation product, yucca schidigera extract, chondroitin sulphate, L-carnitine, dried rosemary. 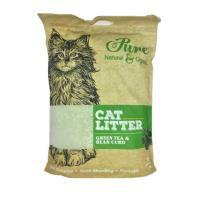 Copyright © 2004 Forever Pets Company Limited All right reserved.